As I sat down at my computer this evening, I racked my brain for a viable topic to write about. The Twins taking two of three from the Orioles at Camden Yards? It works, but it would be a little dry. Kyle Lohse's continued struggles and his slight disagreement with manager Ron Gardenhire? Yeah, but there's not a whole ton to say there. The trade market? Always an idea, but I kinda covered that on Friday. Then it hit me like a ton of bricks. The answer to all my doubts. A piece of news so big (sorta) that it simply could not be ignored by any would-be journalist. Now this headline isn't quite as exciting as say, "Twins trade Jason Kubel and Scott Baker for Randy Johnson", but it is as close as we'll ever get here in Minnesota. Dougie Baseball has been a subject in trade rumors for a few weeks now, and those rumors began to swirl as Justin Morneau continued to hit the cover off the ball and, not coincidentally, the Twins began to win ballgames. With the towering bulk of Morneau waiting in the wings, Dougie's days in the Twins Cities were numbered anyway; it was just a matter of when. I have some mixed feelings about this move. As a person who would like to see the Twins do well this year and in the years to come, I am glad the Twins decided to act quickly. I firmly believe that Morneau is ready for a full-time job in the bigs right now and that he will continue to produce in the #4 spot for many years to come. He hit a monster 3-run bomb today in Baltimore and is batting .299 with 5 homers and 13 RBIs in just 67 at-bats this season. In comparison, Mientkiewicz was hitting a paltry .238 with only 5 homers and 23 RBIs in 281 at-bats. The Twins have not had a bonafide slugger since, well, before I was born, and Morneau seems to be the power threat this lineup has been sorely lacking for so many years. There is also the omnipresent matter of finances. Mientkiewicz is scheduled to make about $4 million next year while Morneau will obviously make the minimum of $300K. However, the nostalgic Twins fan in me is a little saddened at the loss of a key part of the "Turnaround Twins". After growing up during the Dark Years and having almost no fond memories to cling to, I attached myself to the Twins of 2001-2002. Torii, Jacque, Koskie, A.J., Dougie, Milty: they were my guys. While other contenders cobbled together generic contenders through free agency, the Twins did it the right way. This was a group of players that came into their own as a unit. A group that played the game hard, took the extra base, made both the routine and the spectacular play, and came through with the clutch hit when it counted. Doug Mientkiewicz was a stalwart on those teams. He exemplified their fighting spirit: suffered through a miserable rookie season in '99, went down to AAA, won the Olympics, and came back to the majors a force to be reckoned with. 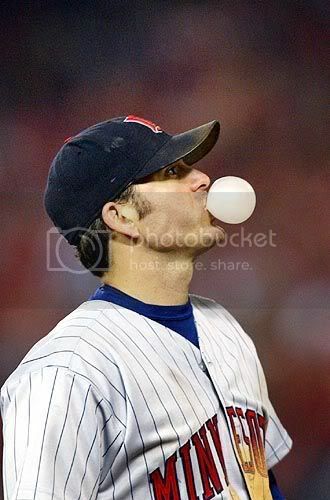 I was proud to say that Doug Mientkiewicz played for my favorite team--the Minnesota Twins. But now, it appears that the time is right for both Doug and the franchise to move on. Doug Mientkiewicz did his job in Minnesota. He anchored a position for three successful seasons, filling a void that had been left empty since the departure of Kent Hrbek. He played spectacular defense and hit well enough to be considered an offensive asset (most of the time). He saved Christian Guzman, Luis Rivas, and Corey Koskie dozens and dozens of errors and helped call attention to the Twins' awesome glovework with his regular appearances on "Baseball Tonight". He delivered with some key hits in the 2002 ALDS against Oakland. We will all miss Mint's solid and sometimes spectacular defense, but this team will not reach the next level (a WS berth) without a big bopper to augment a sometimes lackluster lineup. Dougie's performance (or lack thereof) was becoming a distraction in the local media as Mientkiewicz began publicly lobbying for more playing time. In Boston or Pittsburgh he will get a fresh start and have a chance to help a team that needs him much more than the Twins. Thanks for the memories, Doug. Your time with the Twins may not end very neatly, but we won't forget all that you did for this franchise. And we most certainly won't ever forget how to spell "Mientkiewicz". Side Note: I would also be remiss if I didn't mention the fact that former Twin and Minnesota native Paul Molitor was inducted into the Hall of Fame yesterday. My family has an interesting connection with Molitor, as my dad played against him in a few times during his amateur career including the 1974 Minnesota State Legion Tournament. Molitor's St. Paul Attucks-Brooks team defeated my dad's squad from Bemidji in the championship game, but he always "brags" about the fact that he beat out Molitor for tournament MVP honors. Just a little interesting tidbit on a day when everyone is coming out with their favorite Paul Molitor stories. Congratulations, Paul.